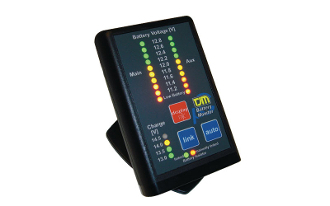 The TJM IBS Dual Battery Kit Includes In Cab Display with a state-of-the-art system using a RISC micro-computer chip to either isolate or link multiple batteries as needed. Normal operation separates the starting battery to safely power electrical accessories when the vehicle isn't running. An override button links the batteries for high-load uses such as winching and is also used for self jump-starting. In-cab monitoring, which uses an LED display to show each battery's state of charge, is available. The system is offered in 12-volt and 24-volt models (controls four batteries). Installation involves an included power cable and a pre-made four-wire harness. The IBS won a Global Media Award as one of the best new products at the 2009 SEMA Show. Low Battery Alarm on both batteries (Beeping and flashing LEDs) - Can be de-activated by pressing display button. Forcable Link Deactivation in case of aux battery failure. In case of emergency (in the case of a defective or discharged starter battery "Main") or in the case of higher power needed, the two batteries (Main & Aux.) are connected by the "link" button is activated (red LED manually connected lights up). After a period of 30 minutes (or immediately after activating the button "auto"), the system switches back to automatic mode. When using an electric winch the system can be activated by double-clicking the “link” button, the battery connection then remains for 180 minutes. In this status every 30 seconds a beep sound comes up to remind you (Auto Return sounds) after the time expired. The load balancing function with the manual battery connection reduces the load on the alternator, the wiring and the batteries when using the winch. If the battery voltage to the starter battery (Main) drops for a longer periods below 12V, the red LED and beep at a slow blink rate is present (blinks at 2 sec interval). If the battery voltage at the aux battery is for a longer time under 12V, the red LED flash frequency with fast & beep (the blinking interval 6 seconds). Use the Display button to turn off the beeper. The flashing red LED goes out when the battery voltage exceeds 12V again. The system monitors the charge on both batteries. 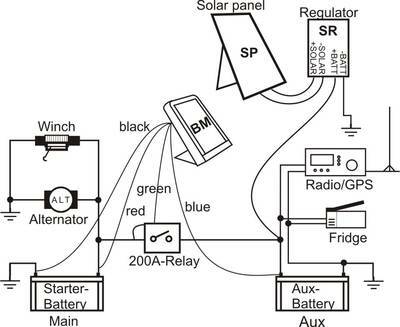 If the system senses at an applied load (alternator, solar, charger) that there is no charge on the other battery, the link fault alarm with a flashing green LED "linked" is displayed and you hear the beep. If this error occurs, you should immediately check the wiring of power cables (relay, battery terminals, crimp contacts, control relays). Once the errors are corrected, the alarm will automatically reset. If there is a problem with the auxiliary battery (Aux) a break down of the battery cells, short circuit or defective battery case, the alternator operates in short circuit, which can damage it seriously. In an emergency, the battery system can now be operated, in the basic vehicle configuration (alternator, starter battery without charge to the auxiliary battery). ) By pressing the link button for 6 seconds (until the sounding of the beep), the link function is disabled. In this operating state no manual or automatic battery connection can be executed. This feature can be reset after solving any cabling problems (by pressing the "Auto" button for 6 seconds the auxiliary battery will be reconnected). Now the system is back working actively with all functions. Connecting a winch according to wiring diagram for the starter battery. While using a powerful winch (Warn/Super winch) or inverters (e. g. US80/12V/24V 800W) it is recommend to activate the Load Sharing Function (manual linkage of batteries). For longer jobs it is recommended to keep the engine running. The Load Sharing Function of the Battery Monitor will increase the output power of your winch considerably. If you choose adequate power cables the Auxiliary Battery can support even a defective or a empty Starter Battery to start safely the motor. In the same way you can start big Diesel engines (also in wintertime).